a chemical labourer q.v. who assists in acids section of explosive factory, making nitric or sulphuric acids, or acid mixing, storing, denitrating, or concentrating plants- cleans out nitric acid retorts, or acid tanks, tends to valves controlling compressed air used for blowing acid from tank to tank, etc. assists in unloading carboys or acid received at works; wheels to acid shed; keeps stock; empties acid from carboys to tanks; returns empty carboys to store; assists in loading lorries with empty carboys. general term for persons engaged in manufacture of alkali; includes alkali labourer, lime dresser, alkali dryer, caustic packer, salt man, stoveman. assists alum maker q.v. by wheeling alum from mill to tanks, shovelling cake alum into tank, etc. attends to re-erection of moulds which are filled with re-dissolved (refined) alum; runs off remaining liquor leaving lump of alum in mould which is taken to pieces for removal of alum. a chemical labourer q.v. employed on anthracene plant of coal tar works; shovels partially dried anthracene into revolving oil extractors (whizzers), or bags anthracene, etc. ; cf. anthracene man (143). a labourer q.v. who assists generally in arsenic plant, wheeling coal, and ore, clearing out condensing chambers and flues, and in any unskilled work connected therewith. wash beck man, wash house man; shovels damped powdered white lead which contains some unaltered metallic lead into vat; runs in water, and operates mechanical stirring gear which stirs white lead powder into suspension; runs off liquor into another tank, leaving sediment of uncorroded blue lead in vat; may repeat process two or three times to ensure extraction of all metallic lead; allows liquor to stand, thus causing white lead to settle, runs off water and shovels out white lead to dry; or runs or pumps off white lead as a slurry to filter press. as for bed man (white lead); obsolete, as work is not now permissible for women. opens valve to run off residue of bitumen from bitumen still into barrels or tanks, while still hot; cleans out still with scraper and brush ready for fresh charge. assists bleaching powder maker (143) q.v. in raking lime over and removal of powder; puts lids on casks of bleaching powder and removes casks to store. loads lime into wheelbarrows, wheels it into gas-tight chambers for conversion into bleaching powder, spreads it in furrows on floor of chamber; in modern mechanical plant, so regulates inflow of slaked lime and chlorine gas by means of valve, that finished bleaching powder emerges from outlet. assists bleachman (148) q.v., in attendance on washing, pulping and bleaching machines. see mixing house man (gunpowder). (ii) fan man, jet man; controls blower or fan for driving gases from place to place in chemical plant. charge house man (gunpowder), runner, service waiter, trolley man; wheels bogies (small trucks) of raw materials, intermediate or finished products, between stores and scattered workshops of explosive factory as required. (ii) places bones to be cleansed in covered metal pot, and controls valve of open steam pipe leading thereto; digests bones with steam under pressure, runs off liquor as before. general term for any unskilled worker, other than a maintenance man, employed in a bone manure factory, boiling, sawing up, calcining and grinding calcined bones or assisting in any of these operations. a grinder q.v. who grinds up bones for bone meal. operates bottle-filling machine which fills four bottles simultaneously; then, by hand, loosely corks bottles and presses corks into position with small power press. a chemical labourer q.v. who feeds and operates a machine for breaking up ice into small pieces for refrigerating purposes in chemical works; places ice blocks into machine and depresses lever. a labourer who breaks pyrites or other ores, etc., by hand with sledge hammer or who places or shovels ore into hopper of crushing machine, in preparation for treatment in a furnace; shovels broken ore into baskets or trucks for transport to other parts of plant. an e.c. worker (143) q.v. who cleans, by hand, sieves or filters through which brine is pumped to cell room for electrolytic chlorine production; sometimes also does other work, e.g. that of cell cleaner q.v. makes briquettes from iron ore or steel scale for use in blast furnaces; shovels clay and broken ore or scale into grinding, mixing and moulding machine, which is controlled by levers. attends to milling machine in which he grinds to a fine powder a bronze-coloured alloy of copper and zinc; shovels small metal nuggets or shavings into chase or hopper; watches smooth working of machine. fires kiln in which briquettes of iron ore dust and a binding composition are burned; loads and unloads kiln with briquettes with hand rake, etc. general term for any man engaged in by-product department of coke oven plant; includes benzol distiller (142), pump man (950), scrubber man (698), sulphate labourer (149), tar distiller (142) q.v. a camphor shop worker q.v. who does unskilled work in connection with distilling or washing camphor for recovery of camphor oil therefrom. is engaged in manufacture of (a) synthetic camphor, (b) pure camphor from crude camphor; assists processman (143) q.v., wheeling and weighing barrow loads of camphor, for distilling, cleaning tanks, etc. ; cf. camphor maker (143). general terms covering persons making percussion caps, including cap drawer (254), cap filler q.v. places holder containing cartridge cases in automatic machine which loads them with primed caps; operates machine and removes holder when primed. pours, etc., powdered or liquid drugs into hopper of automatic capsule making machine, attends machine lever, and replenishes heated tank of gelatine at intervals as required, by putting in strips or blocks of gelatine. carries trays of matches from dipping machine to box filling machine, for use of box feeder (matches) (949) q.v. general term covering workers on automatic machines which assemble parts of cartridges, fill and finish them off, including loader, charger, filler, primer, rammer, service waiter, shotter, turner-over q.v. places nitre-cellulose, after washing, in hydro extractors (whizzers); switches on power, stops machine when water no longer drains away and removes nitro-cellulose. screens oxide (polysulphides of iron received, from gas works) with shovel against vertical screen; shovels oxide into furnace through several holes; rakes over contents by hand with rake; pushes contents to discharging hole in furnace bottom, when burnt; cf. oxide burner (148). tips hutches of crushed oil shale into hoppers which allow it to fall by gravitation into retort. performs work of unskilled nature in chemical works; assists chemical worker (148) q.v. or process worker (143) q.v. in various chemical processes, such as emptying, filling or cleaning out tanks, coal wheeling, cleaning out filter presses, stills, vats; unloading and carting raw materials and loading and carting about finished products inside works; shovelling products into vats, on to hearth or furnace, attending to stoking of fires, running liquors into and and [sic] out of vats, etc., under instructions of process worker (143) or chemical worker (148); taking samples of products at stated intervals from plant to laboratory for analysis; removing bags from filter presses, and taking out dried contents of bags; shovelling wet chemicals, e.g. crystals from crystal vats, into pan of hydro extractor, and removing dried crystals from pan with scoop and packing into barrels; washing out bottles or other containers by hand or by means of special machine, placing bottles inverted on racks in drying room or chamber; or any of the simpler operations performed by chemical worker or process worker under immediate supervision of same; sometimes specifically designated; e.g. acid works labourer, alkali labourer, sulphate plant labourer. cleans out cells in electrolytic plant for manufacture of chlorine, after residual solution has been run out; removes, by hand, brine deposit from anodes and cathodes and refills cell with brine. 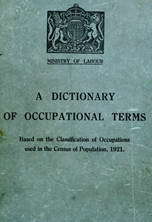 a chemical labourer q.v. who cleans out filter press after use; washes out valves, cleans pipe connections by means of hand rods, and removes traces of solids from filter press cloths and metal sieves. cleans, and keeps in working order, pipes conducting gases from retorts, in which oil shale is heated, to condensers, where oil and ammonia are condensed; uses long-handled tool with auger end which he moves backwards and forwards along pipe scraping out condensed tar, etc., which settles on sides of pipe and would choke it if not removed; cf. augerer (gas works) (699). cleans out stills at end of distillation operation; in mineral oil refining removes coke from bottom of stills by breaking it up and shovelling out into barrows. assists cobalt furnaceman (143) q.v. making cobalt oxide, by shovelling mixed crushed ore and other chemicals on to hearth of furnace, feeding and attending to furnace fires, etc. winds by hand 24 feet of safety or mining fuse on to a bobbin and secures bobbin with tape. a mixer q.v. who mixes, by machine, fulminate of mercury, antimony sulphide, magnesium, aluminium and other compositions for percussion caps, detonators, rockets, lights, flares, star shells, etc. ; for hand mixing; cf. composition maker (148). fills small earthenware pots with wet cakes of white lead from filter presses, cf. white lead filter pressman, places them on shelves of large stove heated by steam pipes, and thus dries white lead; when dry removes pots from stove; obsolete as work is not now permissible for women. (ii) attends to vats in which strong solutions of salts are allowed to cool and deposit crystals; runs in hot solutions, and runs out weak cold solutions; removes, by hand, crystals from vat sides. turns over, by shovelling, heaps of native iron pyrites (sulphide of iron), lying in open air, to stimulate oxidation, and thereby convert it into copperas (sulphate of iron). carries crates of empty match boxes from store to box filling machines for use of box filler q.v., or to match making machine, where the matches as made are automatically filled into boxes. a crusher (manure) q.v. who attends and feeds a crushing machine with bones after they have been cleansed by bone boiler q.v., to break them up prior to grinding by bone grinder q.v. shovels raw material into hopper of crushing machine, which breaks it up to size convenient for next process, that of grinding; watches machine for faulty work; cleans and oils working parts. sets, feeds and operates a guillotine machine which automatically cuts cordite. thread or tape to required lengths according to use for which it is required. saws, by hand or by small circular saw, pieces of dyewood into convenient size and feeds these pieces into special chipping machine, which cuts them into chips ready for extraction of dye by boiling in water; cf. dyewood extract maker (148). pulp weigher: cuts up and weighs pulp for chemical treatment in initial processes of artificial silk making. general term covering persons engaged in making cyanide compounds from any of their various sources. places, by hand, pieces of wood (usually alder or willow) into metal cylinders; clamps lid and drops cylinder into a furnace for given time; rakes cylinders from furnace, allows to cool, removes lid and empties charcoal contents into containers for use in manufacture of gunpowder. shovels or rakes out, into bogies or tubs, finished artificial manure from dens, i.e. steel cylinders in which phosphate manure is made, and wheels bogies to store where he tips out manure. fills tanks with acid, assists anode man (148) q.v., and does other unskilled or semi-skilled work in depositing department, i.e. department where copper is refined by electrolytic process. attends devilling, disintegrating or grinding machine into hopper of which he places or shovels bones that have been cleansed by bone boiler q.v. and/or crushed by bone crusher q.v. ; cf. grinder. shovels into a digester bone, fish, or meat offal, which is slowly carried by a spiral conveyor along a pipe, in opposite direction to a current of steam; controls, by lever, etc., speed of conveyor or inlet of steam so that offal is thoroughly cooked, and all fats, etc., boiled out and carried over by steam current. controls, by lever or switch, steam or electric mechanical digger, which digs out finished artificial manure from dens, cf. den man, ready for conveyance to packing room or store. attends to shallow vessels in which alum cake is cooled; opens valve to run in liquors, puts in dividers and removes cooled cake from trays, chipping where necessary. in electrolytic preparation of chlorine , shovels excess of salt into pan, runs in water and moves lever which sets stirring apparatus going thus promoting solution of salt in the water; allows excess of salt to settle and runs out solution into storage tanks. rakes out, by hand rake or machine, spent oil shale from retort into hutches. slakes lime, i.e. quicklime, by pouring water on it, either mechanically, modern practice, or by hand; sifts lime when slaked, by shovelling it through sieve or into hopper or mechanical sieving machine. a stone breaker q.v. engaged in crashing,. by hand with sledge hammer, pyrites, an ore containing sulphur and iron for use in manufacture of sulphuric acid. places alkali crystals in hydro-extractor, i.e. a perforated cylinder revolving at high speed, with shovel or scoop. ; moves lever setting machine in action, and empties it with scoop when alkali is dry. unpacks casks of ammonium nitrate; breaks up nitrate with hammer, shovels into Atlas drying machine, and sifts dried powder by hand. takes cakes of wet colour from filter press and lays them out in drying ovens; switches-on fan, or gas drying apparatus; removes cakes from ovens when dry and trucks to store. places, by means of fork, washed cotton, before nitration, on travelling band of drying chamber, through which a current of warm air passes carrying off moisture; regulates speed of hand and heat of chamber; places bins for reception of dried cotton when automatically ejected from chamber, ready for nitrator (guncotton) (143) q.v. places frames of match splints which have been treated by impregnator q.v. on shelves of drying oven; removes frames when dried and places them on trolleys for conveyance to dippers (148) q.v. closes and seals ends of paper tubes or containers by hand or machine folding and varnishing after explosives have been filled in by filler (fireworks) (148) q.v. shovels or scoops gunpowder into hopper of machine which sieves gunpowder after granulation, in order to extract dust, which is returned to incorporator (148) q.v. for further treatment. opening a valve, runs dilute solution of glycerine in water into machine which concentrates it by a continuous process of evaporation in vaccum pans; removes, by shovelling, salt which is deposited from solution and which falls (into separate tank; runs out concentrated glycerine for purification. empties blocks of paraffin wax out of trays in which they have been treated by sweater (143) q.v. ; returns empty trays to tray filler. general term covering all persons employed in a works in which fats are hydrolysed and resultant acids are neutralised with alkali in manufacture of soap; may perform any part of work which comprises placing, or shovelling solid fats into steam-jacketted tank, running in dilute acid or alkali solution, and opening valve admitting steam to steam jacket to melt fats, operating mechanical stirring gear, shovelling in salt to salt out soap made, running out separately glycerine, fatty acid, or soap, i.e. , alkaline salt of fatty acid, and salt; assists in unskilled part of work of purifying these compounds. tips hutches of oil shale into hopper of crushing machine, and tends it whilst shale is broken up ready for burning; shovels crushed shale into trucks for removal to retorts, \feeder, splint (matches); feeds frame-filling machine or dipping machine with splints; cf. frame filler, dipper (148). general term for any worker engaged in making artificial manure, including bone boiler, bone crusher, devilman, stone miller, mixer, screener, slag phosphate worker, trimmer, den man q.v. feeds and attends machine for filling brass percussion caps with explosive composition; as for detonator filler. runs into carboys, from storage tanks, measured quantity of acids or other liquid chemicals which need glass containers, ready for despatch; corks, seals, labels carboys when filled and loads for despatch or wheels to store. an explosive filler q.v. who fills small copper detonator tubes with fulminate of mercury or other detonating composition, by machinery; places number of tubes in holder, places holder in machine for automatic filling and withdraws when tubes filled, ready for fuse filler or, if pressing required, for detonator presser q.v. general terms for any explosive worker (148) q.v. who fills, by hand or machine, explosive into cartridges, shells, bombs, grenades, including detonator filler, cartridge loader; sometimes specifically designated, e.g. fuse filler, gaine filler, mine filler, tube filler. puts match splints into hopper of frame-filling machine, and places empty frame in position; by moving levers, fills perforated rectangular wooden frame with match splints ready for hand dipper (148) q.v. controls valves connecting gas (oxygen, acetylene, carbon dioxide nitrous oxide, etc.) pumps to gas cylinders, and continues pumping gas until a predetermined volume of gas has been pumped in as indicated by pressure indicator on a dial; stops pump, closes valve and detaches cylinder. assists kier boiler (143) q.v. by filling boiler with cotton, etc. as for filler, gas cylinder. fills rockets with explosive and coloured fire compositions, wrapping each separately and connecting sections of rocket by a fuse. fills trays with blocks of paraffin ready for sweating; work sometimes done by sweater (143) q.v. draws off liquid sheep dip from a tank into metal drums and casks, and solders openings of drums. pours or runs liquors containing precipitated solids, or suspended impurities on to frame of muslin, canvas, linen or other filtering medium; removes precipitate, after washing it, on to blotting paper, and places it on shelf of drying cupboard or chamber, to dry. (ii) cobalt pressman, cobalt washer pressman, washer pressman; operates filter presses in which precipitated oxide of cobalt is washed and the water finally expressed. operates filter press in Brimsdown process of making white lead; controls valve which regulates flow of white lead suspended in water until canvas bags of filter press are filled; pressure generated by pump forces water out of canvas bags leaving comparatively dry "leaves "of white lead in bags; closes valve connecting pump to filter press, and turns lever applying heavy pressure to contents of press, squeezing out almost all liquid from bags; opens press and removes "leaves" of white lead, which are taken to white lead stoveman q.v. to be dried. gums labels on bottles and packets of chemicals, affixes cork capsules, covers corks with wax or oiled paper caps to prevent evaporation of liquid contents. stokes coal or coke fire under a coal tar still, and sees to burning of waste gases (from still) therein; opens small doors (or ports) which admit air to allow gases to burn. general term for persons engaged in making fireworks, mixing compositions for explosive or coloured effects, assembling, wrapping, attaching instructions, etc. : includes roller (559), filler (148), dubber, and other workers not specifically named. hardens block or sheet casein by immersion in baths containing formaldehyde solution; removes after set period. an explosive worker (148) q.v. who attaches, by band, conical tin fuse-caps to shells, or, inserts shell into a machine and depresses lever to attach fuse-cap. an explosive filler q.v. who fills and makes safety fuses. places gall nuts on iron tray and roasts over gas jets or in oven until shell cracks, so that tannic acid can be more easily extracted for use in process of ink manufacture, or as dye for staining furs or skins. pours pure clarified melted gelatine, drawn off from steam-heated tank of gelatine, into capsule moulds to form flexible or hard capsules used as containers for liquid or for powdered medicines, drugs, etc. a labourerq.v. who breaks up, with steel wedges and heavy hammers, solidified pitch which has been run out as residue from tar still into cooling tank, and thence into huge brick-lined pitch bay; loads broken pitch into wheelbarrows or crane skips for removal. shovels, by means of scoop, granulated gunpowder into revolving barrel which, by rubbing, glazes suface [sic] of granules; cf. graphiter (148). feeds and operates a grinding mill, either of edge runner type, by shovelling material to be ground on to pan of mill, or roller type, by shovelling material into hopper fixed above rollers, to reduce to powder a raw material, or intermediate or finished chemical product; sometimes specifically designated according to the material to be ground, e.g. animal charcoal grinder, arsenic grinder, basic slag grinder, bauxite grinder (manufacture of aluminium compounds), bone flour grinder (manure), bone grinder (manure), brimstone grinder, charcoal grinder (gunpowder), grinder (manure) (in some districts he does not usually feed mill, this being done by a labourer), red lead grinder, white lead grinder. ties grummets, loops of rope, on shells to protect copper bands, e.g. driving band, which project and which might otherwise be injured in transport. shovels or tips crushed copper ores into vats, and copper precipitate into smelting furnace; also does other manual labouring work in connection with treatment of copper ores by wet process. shovels wet crystals of chemical compounds into perforated drum of hydro extractor machine; controls working of machine, i.e. rapid rotation of cylinder, which dries crystals by centrifugal force; shovels out dried crystals when operation is complete. fills frames, cf. frame filler, with safety match splints and dips, by hand, for set period in a bath containing impregnating solution, either phosphate of ammonia or boracic acid, to prevent glowing of wood after match is blown out; puts frames on shelves in drying room to dry ready for dipping. cleans metal jets with acetone to ensure free flow of silk dope in spinning of artificial silk. feeds kiln with prepared ingredients of vitreous enamel in form of powder, taking care to distribute powder evenly: rakes out fused product, which he quenches with water from a hose; rakes this over to expedite drying of finished enamel or flux, knocker-down, bleach. lays out cordite cord and tape on shelves of drying stoves or rooms, where it is heated by steam pipes to drive out acetone, ether, or alcohol used in incorporation of explosive, cf. incorporator (148). is engaged upon an acid plant; does unskilled or semi-skilled work, e.g. opening valves to allow mother liquor to flow back from crystallising tank, starting pump to blow liquor to Glover tower, taking samples of acids for chemist's test. a chemical labourer q.v. who loads packed chemicals on to trucks, lorries, vans, etc. an explosive filler q.v. who fills cartridges with cordite or other explosive and covers charge with felt or cardboard wads, by machine; as for filler, detonator. applies lute or luting, composition to exclude air, with a brush to screw threads of fuses, plugs, etc., ready for screwing home. general term for persons engaged in making or packing matches, includes frame filler impregnator, racker-out, splint dryer, splint feeder, splint shaker q.v. see grinder ; sometimes specifically designated according to product to be milled, e.g., alum millman, bauxite millman, coprolite miller, miller (manure), phosphate miller, stone miller (manure). assists grinder (143) or incorporator (148) q.v. in mixing house. mixes fresh tan bark, i.e. tannery waste not previously used in white lead manufacture, with bark that has been used, by turning over both with fork or shovel; prepares mixture for use by blue bed setter q.v. (iii) mixes two solids by shovelling them together into hopper of grinding mill and operating mill. a mixer (chemicals) q.v. who mixes powdered chemicals, etc., according to prescribed instructions, usually by weighing out proportions, emptying them into pan and stirring up by mechanical stirrer or by hand. prepares and filters silk dope ready for spinning artificial silk. blending house man (gunpowder), composition house worker (gunpowder); assists in gunpowder mixing room, wheels ingredients in from store, assists in weighing them, pours them into large mixing pans and stirs up by mechanical stirrer until mixing is complete; empties mixed gunpowder out of pan by means of scoop into barrels. assists pyrites burner (143) q.v. ; wheels pyrites ore to mundic burners, shovels burnt ore therefrom and wheels to warehouse or to railway trucks. an explosive worker (148) q.v. engaged on repetition work in nitroglycerine manufacture e.g. opening valve to run glycerine into acid tank, measuring liquids, washing nitroglycerine with soda water solution, opening valve to pass explosive through cooling coils. as for packer (solids) ; usually packs alkali, i.e. soda crystals etc., in casks or brown paper packages. packs finished metallic arsenic oxide in casks ready for despatch. shovels bleaching powder from floor of chamber, where it was made, down through holes in floor whence it falls through chutes directly into casks below; in mechanical bleach production, attends to draw hopper, pushes away filled casks and replaces them by empty ones under delivery spout. attends to handling of troughs and ladles for transferring caustic liquors from pot to pot, and assists caustic finisher (143) q.v. in packing it into drums and sealing them. liquids, runs measured quantity of chemical liquids into bottles, tanks, carboys, drums, or other suitable containers; corks or in other ways seals container, and may also label same, ready for store or despatch; solids, crystals, powders, etc., packs weighed or measured quantities of solid chemicals into cardboard, wooden or tinplate containers, casks, or sacks by means of scoop or shovel, ties up or seals container, and labels same according to contents. opens valve and so draws off liquid chlorine from strong steel vessel in which it collects as made, into steel cylinder on weighing machine, until known weight of chlorine is in cylinder; removes filled cylinder on trolley. shovels fixed weight of sulphate crystals into sack, and sews up sack ready for despatch. places number of match box covers on endless feed belt of machine which applies friction paint, on which "safety" matches will ignite, to sides of match box covers; or, removes covers as delivered on band from machine. attends to and replenishes as necessary steam-heated bath of melted paraffin wax in which heated splints are dipped, either in dipping machine, or by hand dipper (148) q.v. in a frame; shovels wax into bath, stokes furnace fire or admits steam to steam jacket, etc. wheels empty drums or casks to sheep dip filler-out q.v. ; brushes labels over with paste ready for sheep dip labeller (949) q.v. and stencils marks on drums and casks. an explosive worker (148) q.v. who picks grit, etc., from cotton before making of guncotton. (ii) operates machine to do work described above. puts electric tubes into perforated plates ready to receive explosive charges; as for filler, detonator. shovels calcined copper ore from furnace, and empties it from barrows into washing tanks preparatory to being treated with acid in wet process. shovels crushed calcined copper ores in tank, runs in acid, controls mechanical stirring apparatus; drops or shovels in iron scrap, turnings, etc., to solution formed, and stirs to assist precipitation of copper from solution; runs off liquor and admits fresh water to wash deposited copper, ready for smelting. feeds machine with cotton to be teased out, i.e. loosened, prior to chemical process. feeds sheets of paper to machine which cuts them up prior to chemical process. using hand masher, rams weighed amount of cordite paste into metal cylinder having perforated base, and passes to moulder (explosive) (148) q.v. ; sometimes himself moulds. presses detonating composition into detonators, tubes, etc., by special press; places filled detonators, etc., cf. filler, into press and depresses lever. assists presser or pressman (148) q.v. in press house; wheels trucks of milled gunpowder to pressman, and tips or shovels it into hopper of machine; places cakes of gunpowder on trucks and wheels them away. feeds and operates machine for compressing gunpowder into cylindrical pellets for use as blasting charges in mining. stamps or stencils size of slot on wad of cartridges. (ii) controls flow of liquors through settling tanks, shovels therein neutralising agents and similarly removes sediment when tank is empty of liquor. see firework maker ; cf. pyrotechnist (148). takes matches out of frame in drying room after they have been dipped and dried, and empties into wooden containers; cf. dipper, (hand dipping) (148). rams home, felt or card wad into cartridge case with hand press., after it has been filled with explosive. winds cordite, after moulding by charge moulder (148) q.v., on to light perforated zinc wheels, ready for drying. winds fuse on to reels by machine; fixes reels on machine and sets machine in motion; stops machine and removes reels when indicator shows that correct length has been wound. see glazing house man (gunpowder). a chemical worker q.v. making refined chalk to be used as a base for pills and tablets; shovels powdered chalk into tank, runs in water and sets stirring gear in motion; runs off purer chalk in suspension in water and repeats operation till chalk is thoroughly washed and all impurities have sunk to bottom of tank; allows liquor to stand to deposit chalk, runs off water and shovels out purified (levigated) chalk on to trays to be dried in drying chamber. eases oil shale retorts, when shale gets jammed, by pushing shale with long iron rods. feeds and attends to power-driven crushing rollers, through which he pushes corroded lead strips to powder up white lead ready for the process of extraction of 'metallic (blue) lead, which has escaped corrosion, by beck man q.v. see packer, sulphate of ammonia. a bogie man q.v. who wheels salt from store to salt cake decomposing pan man (143) q.v., or in electrolytic process of chlorine manufacture, shovels salt into tank, runs in water and stirs to assist solution, in making up salt solution. saws up large bones by hold ng them against a circular saw, to separate best parts, used for cutlery handles, from inferior parts which are to be ground up for manure. tends an automatically fed screen which separates oversize particles from material discharged from grinding mills; oils bearings, starts and stops screen as required by means of a lever; may also shovel rejected lumps into trucks or barrows for further grinding. an explosive worker (148) q-v. who assists nitrator (guncotton) (143) operates valves to run off nitrating acids after process, or to run in water in place of acids. carries on small hand trucks, materials or half finished products to or from various workers. spreads thick layer of spent tan bark on floor of large brick chamber; sets thereon stout earthenware pots containing dilute acetic acid, and rests strips of metallic sheet lead on top of pots; covers this layer with boards; builds thereon another layer, and soon, until stack so made reaches nearly to top of chamber; caulks door of chamber and keeps closed until corrosive action complete, e.g. , six weeks; uncaulks door, takes down stack, removes white lead formed. assists blue bed setter q.v. by putting pots in blue beds in stack process of white lead making. breaks up, with sledge hammer, black ash, cf. black ash maker, revolver firer (143), into lumps, which he wheels away; shovels material into lixiviation vats; runs in water, bubbles in steam, heating until liquor reaches standard by Twaddell test; runs off liquor and shovels precipitate from vat for sulphur recovery. puts match splints into a machine which shakes them parallel, straightens, cleans and deposits them in a box; carries boxes of splints to trolleys for despatch to match-making department. arsenical sheep dip, attends steam-jacketted pans in which he dissolves ingredients of arsenical sheep dip in water; starts and stops mechanical stirrer to aid mixing; runs-off cooled liquor to concentrating tanks; sulphur sheep dip , general term for any person engaged in manufacture of sulphur sheep dip, e.g. drying, grinding, packing, etc. places shot or bullets in hopper of machine and moves lever operating automatic apparatus which fixes bullets in or loads shot into cartridge case. an explosive worker (148) q.v. who feeds, starts, and stops machine which sifts detonators with sawdust after fulminate of mercury charge has been pressed in, cf. detonator presser, to remove any local particles of fulminate that may adhere; replenishes saw dust hopper at intervals as required; places detonators into, and. takes from, barrel of machine. works-up, by hand, pulp of nitro-glycerine and gun cotton, transfers to a sieve box alongside leaden mixing trough, and rubs pulp through sieve to find and extract all impurities and lumps in it. after mixing of nitro-glycerine with kieselguhr, carefully rubs dynamite powder through metal sieve to extract any lumps which may have been formed. shovels granulated gunpowder into machine to be automatically sifted into sizes. general term for any unskilled worker, other than a maintenance man, employed in a slag phosphate works, e.g. grinding, wheeling, mixing, bagging. tends machine which makes snap caps, for toy pistols, by sticking two narrow strips of paper together and enclosing between them at regular, intervals a small quantity of explosive paste; machine may also cut caps apart; feeds machine with paper, gum, and explosive paste as required. picks out foreign matter, horns and hoof, pieces of metal, rag, leather, etc., from bone heaps; also sorts bones, to separate better material for use in manufacture of bone handles, buttons, etc. ; cf. bone sorter (159). controls automatic machine with hand lever which spins cotton yarn round a centre core of gunpowder; replaces empty bobbins of cotton with full ones; watches proper flow of gunpowder through glass panel. assists spirit mixer (148) q.v. in spirit shop in recording stock of spirit, and amount issued to celluloid processmen; distributes, by hand, carefully measured quantities. passes filled boxes of matches down a spout or chute of automatic wrapping machine or down spout supplying wrapper (matches) (949) q.v. an explosive worker (148) q.v. who attends filling machines which load cardboard cases of star shells with explosive and lighting chemicals; replenishes machines with chemicals, inserts cases, depresses levers. places yarn in hot air stove to dry. attends to drying stoves for drying finished products; shovels alkali into and out of stove; regulates gas or steam valves or stokes furnace to heat drying room. see stove hand (artificial silk). attends drying stoves in which he dries natural pigments after being refined by levigator (148) q.v. ; places trays containing moist pigments on shelves of drying stove and removes them when dried. (ii) fills small earthenware pots with wet cakes of white lead from filter press, cf. filter press man, and places them on shelves of large steam-heated stoves to dry; removes pots carefully when white lead is dry. removes yarns of artificial silk from stoves when dried. using special tool, strips off deposit of gold from cathode upon which it is deposited out of solution by passing an electric current. empties stack or chamber and carries lead, now corroded and changed into white lead, in trays, to crushing rollers, where it is ground ready for levigating in order to separate from it any remaining metallic lead. assists copper sulphate maker (143) q.v. by wheeling ores, running acid into vats, shovelling sediment from vats, etc. does unskilled work in connection with a sulphate of ammonia, or other sulphate, plant; cleans out tanks, runs in acids and other liquors, removes crystals from crystal vats, operates and feeds hydro-extractor for drying crystals, and bags crystals ready for despatch; may also attend to lining of ammonia stills, assist at stills, and help sulphate maker (143) q.v. generally. discharges and loads crude or refined liquids from or into tanks, connecting up flexible pipe lines and operating valves and pump; cleans tanks and tank wagons. general term for persons employed on plant in which coal tar is distilled and individual products extracted and purified; includes tank man q.v. does general labouring work in tar distilling plant, e.g. wheeling coal, opening and closing valves admitting or running off liquor, cleaning tanks, cf. tank man (tar distillery). samples, weighs and tests artificial silk for quality when spun. places tetryl, high explosive, into corning or granulating machine and depresses lever for automatic making of pellets used in shell primers. a labourer preparing dried and pressed sewage silt for manure; shovels manure from railway trucks into barrows; feeds and attends grinding and sack filling machines, etc. tips spent shale, after distillation, from hutches on to spent shale heap or bing. shifts or trims by shovelling heaps of slag phosphate, etc. ; shifts other raw materials or manufactured products at rock sheds or at "dens." see service waiter (cartridges) . turns in mouth of stiff paper cartridge (sporting cartridges) to hold charge in position, using a power or hand lathe. .
threads by hand, electric wire through holes in cap or detonator and twists wires together by hand. (ii) varnishes parts of metal fuses. a chemical labourer q.v. who cleans chemicals by shovelling them into tanks, running in water, setting in motion mechanical stirring apparatus, or stirring by hand, allowing chemical to settle out and running off water with soluble impurities. washes spent copper anodes after withdrawal from electrodepositing tanks, to detach metallic sludge which is to be treated for silver and gold. washes, by directing hose on, tan bark taken from white beds, i.e., blue beds in which corrosion of lead strips is complete with formation of white lead, to remove residual lead and prepare bark for re-use. washes off, by hand, sulphate of copper from pure copper cathode after removal from electrodepositing tank. feeds and attends machine through which sheets of nitro-cellulose, after bleaching, are passed over and under rollers in several water baths. a washer, q.v. who collects and removes salt thrown out of glycerine liquor which is being concentrated; salt falls into special vessel at bottom of evaporating apparatus, and may be extracted by opening valve and allowing it to run out, or by blowing it out by means of compressed air; washes salt to remove glycerine, by stirring it up with cold water, and running off liquor. places over steam pipe and so washes out new or old kegs and drums in which refined glycerine is to be packed for transport; removes kegs to drain. removes, by hand, anodes and cathodes from electrolytic gold recovery bath; immerses them in bath containing strong sulphuric acid to clean. see washer, crude glycerine salt. a chemical labourer q.v. employed in washing out residues in stills to clean them for further use. general term for any person engaged in making wax vesta matches from specially prepared thin wax taper; includes dipper (148), frame filler, spout girl. weighs out on special weighing machines (some working semi-automatically) quantities of chemicals, acetone, raw cotton, gun cotton (into rubber bags), etc., for use during manufacture of explosives or for charging of cartridges, shells, etc. ; sometimes specifically designated, e.g. , acetone weigher, charge weigher, cotton weigher, nitro cotton weigher. see cutter, pulp (artificial silk). wheels on trolley or truck various materials in chemical works; wheels broken ores, stones, etc., from heap to furnace and ash or residues from furnace to bins: wheels in coal and wheels away cinders; wheels liquids in tanks, loads of anodes, etc., on trucks; sometimes specifically designated, e.g. , ash wheeler, coal wheeler, white ash wheeler. shovels or scoops naphthalene crystals taken from naphthalene crystal vats into large metal hydro-extractor or whizzer and moves lever operating same to extract as much coal tar oils as possible, before sending crystals on to naphthalene pressman (148) q.v. places cotton, from picker (guncotton) q.v. , into willowing machine, starts up mechanical beaters for removal of dust and removes willowed cotton from machine. see precipitator ; obsolescent term.